Step 3: eat the carbs, all of them. Preferably high glycemic carbs. Other: no dietary fat post-workout; protein periodically throughout the day. What makes CBL different from its predecessors is the stress on the timing – exercise and carbs in the evening. John Berardi’s “Massive Eating” dietary guidelines are similar: protein+fat meals all day except pre- and post-workout, which are protein+carb meals. Martin Berkan’s “LeanGains” is fasting most of the time (including pre-workout), exercise in the afternoon, then a big post-workout meal (quite similar to CBL). My only tweak, as discussed below (and previously here and here), would be a pre- rather than post-workout meal [in some contexts]. There’s a summary of this blog post at the bottom… it might be helpful to read that first (see: “Tl;dr:”). Also, please note that much of this post is about the fringe of theoretically optimizing nutrient partitioning, like improving from 85 to 90%, or 40 to 45%, not 40 to 90%… I’m not that deluded. My initial take, in general, is that this book is loaded with gems about nutrition, exercise, biochemistry, and physiology. It’s also very readable and has a lot of good recommendations. In this post, I want to discuss one specific aspect of CBL: tissue-specific circadian regulation of metabolism. Emphasis mine: “We have, however, discovered something useful about the relationship between insulin sensitivity and the time of day. In the morning, cells with GLUT4* react more strongly to insulin than in the evening [6-8]. Think of this as a mini life-cycle that’s reset each night… The same things happen, just on a shorter time scale: we wake up insulin sensitive, and go to bed somewhat insulin resistant. *“cells with GLUT4” refers to both muscle and adipose, although there are some important differences in how circadian rhythmicity impacts the effect of insulin on metabolism in these two tissues. Disclaimer #1: you have to buy or at least understand the insulin hypothesis of adipose tissue growth to appreciate CBL. Disclaimer #2: a summary of recent studies comparing ingesting the majority of calories in the morning vs. evening is summarized here (and more below). In brief, a large body of evidence suggests that skipping breakfast and eating a big dinner may not be the most optimal pattern of calorie distribution. It’s very nuanced, however, to say the least. We know exercise induces skeletal muscle glucose uptake independent from insulin – that’s one of the reasons why it helps glycemic control in diabetics… but according to CBL, insulin sensitivity is higher in the AM, so PM exercise provides a relatively greater boost in insulin sensitivity, selectively in skeletal muscle. In essence, carbs after a morning workout may be more “fattening” than those after an evening workout. And CBL stresses that high GI carbs and subsequent quick & dirty insulin spike are necessary for muscle growth (let’s just go with that for now, although I have my share of reservations). Saad and colleagues did one of the most straight forward studies on this – they measured glucose and insulin levels following an identical mixed meal administered for breakfast, lunch, and dinner (Saad et al., 2012). The meal: 10 kcal/kg; 55% carb, 15% protein, 30% fat. The effect: glycemic excursion was the smallest after breakfast, although this was due to increased insulin secretion (seemingly in contrast to CBL theory, which states that “In the morning, cells with GLUT4 react more strongly to insulin than in the evening” …although an earlier study by Gibson suggested both mechanisms may be at play). After dinner, on the other hand, the glycemic excursion was higher (not necessarily due to insulin resistance, but to lower insulin secretion). The “PM glucose intolerance” phenomenon is relatively consistent in a variety of experimental paradigms (see also Tato 1991, Dos Santos 2006, Morgan 2012, and Gibbs 2013). Regarding the validity of CBL, does it matter if glucose clearance is enhanced via increased insulin sensitivity or increased insulin secretion? Why it might not matter(pro-CBL): slamming carbs in the evening post-workout was supposed to be safe because of circadian insulin resistance in muscle and adipose, but exercise reverses this selectively in muscle, so fat tissue will resist growth in the face of a huge surge in insulin. In this context, lower insulin secretion in the evening could accomplish the same thing. Why it might matter (not pro-CBL): CBL assumes “insulin sensitivity” means the same thing in muscle and adipose. However, “insulin sensitivity” is most frequently assessed by measuring blood glucose levels after an oral glucose load (eg, OGTT). And adipose has a very small role in clearing this glucose… maybe 2-3% ends up in adipose whereas the vast majority goes to skeletal muscle. In adipose tissue, we’re more concerned with insulin’s effects on fatty acid uptake, lipolysis, etc. ; ie, adipose growth. There was slightly less insulin secreted after dinner relative to breakfast (AUC: 5133 vs. 4858); however, the response of adipose tissue to even very low levels of insulin is swift and robust. In other words, adipose growth is maximally stimulated at low levels of insulin, such that the small reduction in insulin noted after dinner may have no meaningful impact. Why it might not matter (pro-CBL): Kiefer cites 3 papers to support the claim, “after resistance training, storing body fat is nearly impossible for up to an hour” (Krzentowski et al., 1982, Bird et al., 2006, and Folch et al., 2001). On face value, I buy this up to the degree of exercise-induced increase in sympathetic nervous system signaling (increased lipolysis, decreased insulin, etc.). Further, if this is true, then it partially attenuates the selective circadian advantage of doing this at night. 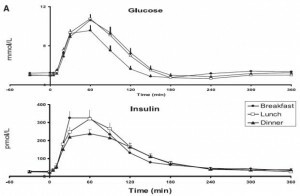 Why it might matter (not pro-CBL): one of the reasons CBL recommends high glycemic carbs is for a quick & dirty insulin spike, so insulin is elevated to stimulate muscle growth during this hour when “storing body fat is nearly impossible.” However, as seen in the figure above, insulin peaks at 60 minutes and is still quite high until at least 3 hours… Furthermore, the Krzentowski paper showed that exercise further delays the insulin response, pushing it farther outside of this post-workout window. I’ve said in the past, and still maintain that the safest time to “slam carbs,” if you so choose, is pre-workout, because exercise attenuates the insulin response and favors nutrient partitioning. This would also keep the insulin spike more closely contained within the [theoretical] post-workout hour of adipose growth-resistance. Thus far, CBL’s recommendation to slam carbs post-workout (or preferably pre-workout) may be useful. Kiefer also promotes exercising in the fasted state to maximize fat burning, and while this may be true, it could come at the expense of lean mass (which could be potentially offset, to a degree, by a small protein-rich meal). Also, I suspect the difference in grams of fat burned above baseline during exercise in the fasted vs. fed state is small (ie, not orders of magnitude). The theory of CBL “timing” remains on the docket. What we need are data on circadian fluctuations in the sensitivity of adipose tissue to insulin… WHICH WE HAVE. Insulin tolerance test: jab a few healthy people with 0.05 uU/kg insulin in the AM or PM, and see what happens (Gibson et al., 1975). In agreement with the aforementioned studies, insulin caused a greater reduction in glucose in the AM than in the PM (48% vs. 34%). However, adipose is more sensitive to insulin at night than in the morning. Insulin suppressed free fatty acids by 47% in the morning but by 64% in the evening. This was repeated by Morgan and colleagues, who showed that the rate of decline in fatty acids was significantly faster in the PM than in the AM after an insulin injection (491 vs. 149 uM/15 min). Glucose tolerance test: 50 grams of glucose administered in the PM caused a significantly greater reduction in free fatty acids than in the AM (75% vs. 65%) (Zimmet et al., 1994). Meal tolerance test (similar to Saad): free fatty acids were lower for ~9 hours after an evening meal compared to an identical morning meal (Sacks et al., 1999). Also, beta-hydroxybutyrate, a ketone body and marker of elevated fat oxidation, bounced back to a significantly greater degree after the morning meal than after the evening meal (these conditions were controlled for physical activity and pre-meal fasting duration). Disclaimer #3: I don’t think the differences are going to be quantitatively more important than, for example, “adherence.” That is, if sleep quality is high (a necessary pre-requisite) and your diet is in check, then exercising at the wrong time won’t screw up your progress… sleep and diet just seem more important than exercise timing, imo. As mentioned above, there is a large body of evidence suggesting that for the casual dieter, consuming the bulk of the total food intake earlier in the day may be more effective for weight loss and body composition. Tissue-specific circadian metabolism agrees. Inconvenient, perhaps, but these data cannot be overlooked. However, in at least one study (Sofer’s Israeli cop study) limiting carbs to dinner on a hypocaloric weight loss diet was better than spreading them evenly throughout the day (it’s admittedly not a perfect comparison)… those assigned to eat carbs only with dinner experienced a greater improvement in body composition – they lost more body fat and less muscle (+1! )… although this may have been somewhat confounded because the dinnerCarb group had more fat mass to begin with, and this condition is known to favor greater fat loss on a given energy deficit. And this study, which Joseph Agu included in his review of CBL (Keim et al., 1997): 70% of the food was given in either the AM or PM. The results showed that while the AM group lost more weight, they lost more muscle and less fat than the PM group (-1!). HOWEVER, the researchers bollixed the crossover. *ugh* That is, there was no washout period. This is a grievous error and an insult to the crossover study design. See also Martin Berkham’s review of AM vs PM eating here, and Layne Norton’s review of ‘carbs at night’ here. Will CBL work? Sure, for some, especially because of “convenience” (which I suspect is definitely not what the author wants to hear) – skipping breakfast, late afternoon exercise session, big dinner… easy peasy! But the reverse may be equally effective: peri-exercise is the ‘safest’ time to carb-load… but it’s not clear [to me] that doing this in the evening has any body recompositioning advantage over the morning, biologically speaking, circadian proper. There might other benefits, however. For example, anecdotally, some people report being able to lift heavier weights in the afternoon than in the early morning. That could very well be true, and might be very important in certain contexts. All in all, CBL a pretty good book, and covers much more than what I reviewed here, which is mainly just one minor point: the circadian aspect of tissue-specific insulin sensitivity. I’m not a huge proponent of carb-loading (back, front, or otherwise) (would prefer to see a higher protein:carb ratio for body composition), but it seems as though CBL would work just as well, if not better (in theory), if everything was shifted to earlier in the day. Am I missing something? Postprandial glucose clearance is a surrogate for muscle not adipose insulin sensitivity. The studies on adipose insulin sensitivity show that it is relatively higher in the evening, so this may not be the best time to slam ze carbs. AM: high insulin sensitivity; carbs now = muscle & fat growth, exercise may only offset fat growth due to improved nutrition partitioning. PM: low insulin sensitivity; carbs now = exercise necessary to improve muscle insulin sensitivity leading to muscle but not fat growth. AM: high muscle insulin sensitivity, low adipose insulin sensitivity; carbs now are OK, and exercise is better (but not necessary, unless goal is muscle growth)…? PM: insulin sensitivity low in muscle, high in adipose insulin; carb-loading now requires exercise to increase muscle insulin sensitivity and offset the high adipose insulin sensitivity by improving nutrient partitioning. UPDATED Affiliate Links: It’s 2018, join Binance and get some damncryptoassets or download Honeyminer and get some Bitcoins for free! Still looking for a pair of hot blue blockers? Carbonshade is offering 15% off with the coupon code LAGAKOS and Spectra479 is offering 15% off HERE. This entry was posted in Advanced nutrition, circadian, diet, Energy balance, Exercise, fat, insulin, melatonin, muscle, Protein, strength, TPMC and tagged body composition, calories proper, carbs, circadian rhythm, diabetes, diet, energy balance, exercise, melatonin, muscle, nutrition. Bookmark the permalink.